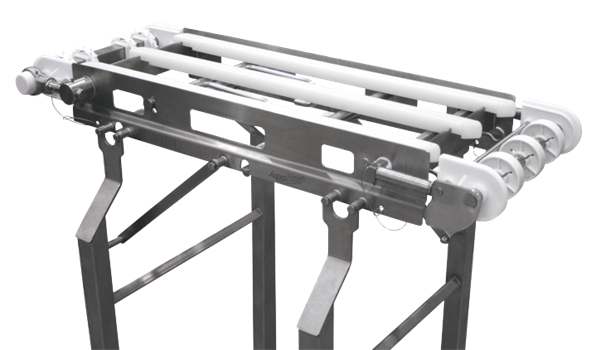 AQUAPRUF 7600 ULTIMATE SERIES CONVEYORS – StampTech Inc. The ULTIMATE Series has been engineered for Fast & Effective Sanitation in the most demanding environments. These include RTE foods, raw protein (meat – poultry – fish), dairy and other environments with high pressure sanitation requirements. Frame is designed with no horizontal surfaces for optimum cleaning. 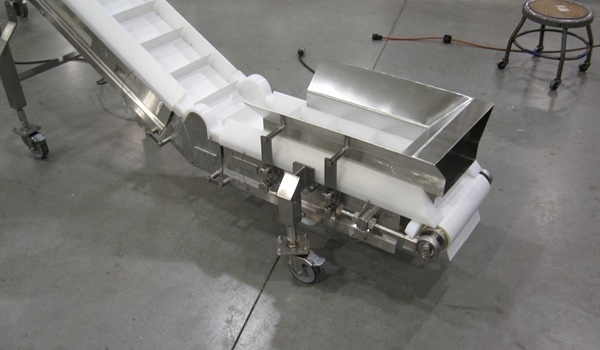 Conveyors over 10′ long consist of multiple sections which are bolted together (can be welded together on site). Solid Urethane belt is sprocket driven for consistent performance and has no bacteria harboring hinges or pins. Open Belt Tracking Flanges and solid UHMW idler pucks create access to pulleys. TIG welded stand offs keep fasteners out of the food zone.